A rendering of a proposed streetcar running on Berry Street in Williamsburg, Brooklyn. According to the city’s plan, the street could become a “transitway” used primarily by streetcars and pedestrians. Mr. de Blasio proposed the streetcar, known as the Brooklyn Queens Connector, in February, and now New Yorkers can see where exactly it might run and the potential impact on their neighborhoods. The streetcar line, which would travel about 16 miles from Astoria in Queens to Sunset Park in Brooklyn, is the mayor’s most high-profile transportation priority and could open by 2024. In a 25-page report on the routes, city officials outlined the benefits and drawbacks of using certain streets in each neighborhood, including the width of the road and how close the street is to subway lines for riders who want to transfer. Maps also show how the streetcar could travel over bridgesto cross Newtown Creek and the Gowanus Canal — a potentially expensive part of the plan if new bridges are built. “We now feel that it’s very important and a real inflection point in the process to lay out the options and get some feedback,” Alicia Glen, the city’s deputy mayor for housing and economic development, said in an interview. Berry Street in Williamsburg, for example, could become a “transitway” used primarily by streetcars and pedestrians, according to a city rendering showing expanded sidewalks and a station with screens showing arrival information. The road would be closed to most vehicles with some street parking allowed, city officials said. 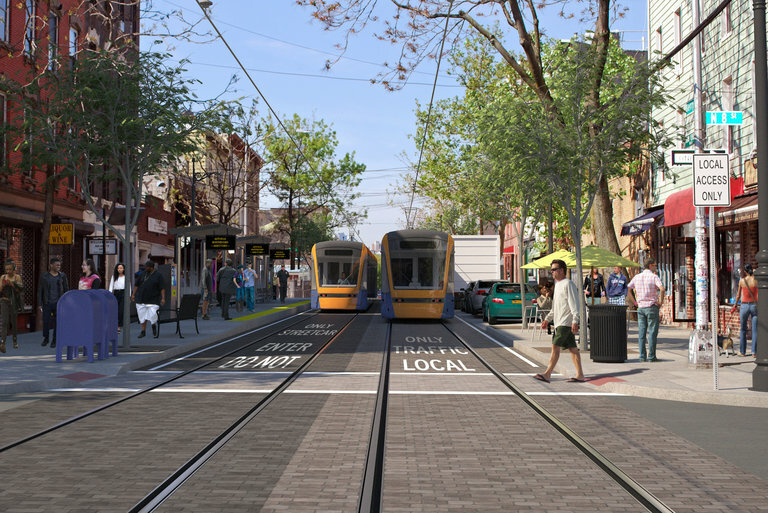 This summer, Adam Giambrone, a former chairman of the Toronto agency that runs North America’s largest streetcar system, was hired to lead the project. Mr. Giambrone said the route would have a dedicated lane in traffic as much as possible — an effort that could prompt anger among drivers over the loss of street space and parking. Without their own lane, the streetcars would get stuck in traffic as buses currently do, Mr. Giambrone said. “We are strongly leaning toward doing everything that’s practical to put this in a dedicated right of way,” he said. Mr. de Blasio, a Democrat, proposed the streetcar to connect a string of growing neighborhoods where, he said, rising real estate tax revenue could finance the system. Some transit advocates have questioned the usefulness of streetcars in other cities and have argued that a bus route with a dedicated lane could be a better move. This month, city officials are planning to meet with community boards in Brooklyn and Queens to discuss the streetcar routes. The city could begin the project’s environmental review next year and construction in 2019. In Downtown Brooklyn, the streetcar could run along Tillary Street before traveling south on Court Street, which the report notes has “excellent connections” to the subway. In Red Hook, Brooklyn, the line could run along Columbia Street or closer to the water along Van Brunt Street. After examining where people live, the location of public utilities and possible subway connections, city officials are considering moving the line farther from the waterfront than originally imagined in some locations. “It’s become increasingly clear to us that there are places where moving it further inland makes sense,” Ms. Glen said. But Councilman Costa Constantinides, a Democrat whose district includes Astoria, said he wanted to make sure the streetcar served people who lived in so-called transit deserts near the waterfront, like the Astoria Houses, a public housing development. “In the western part of my district, they can see Manhattan from their homes and yet it’s one of the longest commutes in the city, and into Brooklyn it’s even longer,” he said. Mr. Constantinides said that he did not yet have a favorite route of the four proposed in Astoria, but that he was glad the mayor was thinking big on transportation. “We’re going to make sure our community has a voice,” he said. Does anybody know who are the consultants working with the city on this project?? Engineers? Might be Parsons Brinckerhoff. That rendering in the article is theirs. Good... I'm involved in a few big projects with the city and will be attending some more meetings in the coming months.. Would like to reach out to the consultants and see if I can be of assistance. That's enough info for me to run with. I'll figure out who else is involved with some digging later when I have a chance to research. lol... My interest in the project is only monetary. The city is usually required to hold community meetings and provide other services, which is where I come in as a consultant. We lost an RFP for some community meetings earlier this year but it's worth a shot. They are always interesting though and if I'm not busy coordinating things behind the scenes I get to see a real show. I expect these meetings to be just as entertaining. Quite a few communities are not pleased with this project. I think it should run beyond Sunset Park. It leaves out South Brooklyn entirely which also has limited transportation options. Been awhile since I've done the bidding thing but trust I understand a man's got to live as well. I'm not quite sure where to place this project honestly it's not really good or bad it's all new territory. I feel it has to connect and work with the Subway just looking at the maps almost seems you'd have to create a second route or expand. But when you say South Brooklyn are you thinking Bay Ridge? Bath Beach? lol... Well seeing that it ends in Sunset Park, there are definitely services that the city must offer at these meetings so I might as well try to get a piece of the pie. Regarding your other question, Bay Ridge is what I was thinking. Besides they wanted ferry service when I was involved with that project and should that service fail (something that hasn't been discussed at any of the meetings I attended), then you're left with just the train and the express buses along Shore Road. didn't deblasio hire the former ttc chairman to head this so the city can know how to get a streetcar right? Where in Bay Ridge would you put it? Along Shore Rd. Those who currently take the should lobby for better service. The people that need more help are those west of 4th Avenue. It's a schlepp to get the and the local buses that would take them there run like crap. When I considered moving back to South Brooklyn, I looked at an apartment on Shore Rd and 92nd. The broker that took me noted how terrible parking was (when we drove to the location, it took quite a while to find a space) and I remember the B16 running like crap even back then. Beautiful apartment (and pricey even then as has always been the case with Shore Rd. ), but when I considered the price and the lack of amenities, it essentially stopped me from going through with taking the place. When I considered moving there a few years later, they had axed weekend express bus service, which pretty much sealed the deal for me, and hence I'm in Riverdale... Now the prices on most of Shore Rd for a nice 1 bedroom are relatively on par with Riverdale near Henry Hudson Parkway where the express buses and Metro-North shuttle runs (~$1,800.00 - 1,900.00 for a 1 bedroom or thereabouts in Bay Ridge vs $1,900.00 - 2,300.00 in Riverdale), but the transportation options along Shore Rd. are not nearly as good as I what I currently have. It makes it that much more isolated as a result since you have no shopping unlees you're very close to say 3rd Avenue where you have a few options deep into Bay Ridge. Shore Rd is wide enough that you could have such a service, and if need be cut into the sidewalk on the side where the park is located to widen it. That streetcar is going to carry air on Shore Road. if you want to get good ridership in Bay Ridge, it virtually needs to be on either 3rd or 5th Avenues (I even doubt you'll get good ridership on 4th because it's too residential). Do let us know if you hear of any dates for community meetings for the project. if they have one in the Bay Ridge/Sunset Park area, I may attend. 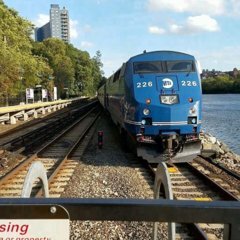 Well ferry service is coming to Bay Ridge sometime next year near Shore Rd. The second round of meetings (I attended some) happened earlier this year. I assume now that they've released this document, they would have to have more. They're required to hold a certain amount of meetings. I was at one in the Bronx that had maybe two people show up if that. lol Meetings for this tram service should be starting very soon. For ferry service, I am not sure if there will be more of them but may still be able to submit comments in writing via e-mail or snail mail. It's weird how the report says that people were very receptive, when the meetings in Astoria, Red Hook, and Sunset Park were anything but. I would not like a pretty obvious gentrification Trojan horse to be built in my neighborhood either. Shouldn't that money go to a project that will benefit Manhattan instead? Better intra-Kings/Queens transit options will just turn that side into another Manhattan, and who wants that? Let them ride bicycles. Supposedly there are more coming in the fall... I haven't had a chance yet to do more digging with my busy schedule and meetings to prepare for but I'll do more digging later today. This might be surprising, but there are already preexisting dense, underserved communities in the outer boroughs with far worse travel times than these neighborhoods which are not particularly far from the . Give them exclusive lanes for buses (which this project doesn't even have! ); we don't have to humor transplants who won't ride the bus with "those people" or real estate developers by diverting billions from other potential projects. Even the city's own streetcar study, puffed up to make the project look good, doesn't see it as more than a glorified subway feeder bus. Hasn't pretty much all of the money recently gone to projects that benefit Manhattan? Like the areas along Utica and Nostrand (south of the Junction). All the needs is improved frequencies, improved transfers (The passes but doesn't connect to the ) and maybe open-gangway trains (which would reduce the amount of crowding in the first and last cars by allowing people to move along the train). What's the funding structure like? Money isn't always interchangeable take the money from the streetcar project doesn't mean it's going to end going to the MTA for subways am I correct in that assumption? This would be a DOT project, but at $30 million a year for maintenance, I have to wonder if it is worth it, especially if it is built in high risk zones. Would be better off having this funded privately, since there seems to be gentrification concerns. The developers are likely all over this. They plan to have the cost be roughly that of a subway ride, which means it will need to be a hit from the start. Umm gotcha. Valid point with the flooding risk. What are they forecasting for revenue? What do we think another option could be? Bus? BRT? Select? Is it a possibility this is money the City received just for the project so it's this or nothing? Developers should have to dip into their pockets, after all, there project's ride on the backs of transit infrastructure. I agree there! It isn't clear where the 2.1 billion that the City estimates to build this would come from, but supposedly, per the AMNY article, the system would be paid for "by an anticipated increase in property tax revenue from the development along the corridor". I can see why this is being depicted as a sweetheart deal for the developers. If they can build up these areas and jack up rents and ask prices to purchase with luxury buildings, they'll gladly pay the increase in taxes if it makes the buildings worth more in overall value. It's a win-win for the city. You spur more gentrification, forcing the need for more development and more taxes, as more buildings will be needed to deal with those displaced by higher rents/mortgages.